Congratulations to Fr. 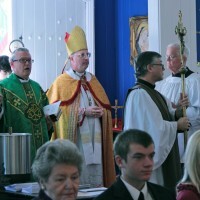 Terry Hall who was instituted as the Rector of St. Hilda's by the Archbishop on November 18. Many thanks to all of those who attended and especially to those who worked long hours to prepare the veritable feast that everyone enjoyed after Mass. We look forward to a long association with Fr. Hall and his family.